The Occupy movement may have been relatively short-lived, yet it succeeded in igniting a flame of hope in the hearts of millions of dispirited and debt-ridden Americans, and in sparking a long overdue conversation about the widening chasm between rich and poor, between the lofty rhetoric of democracy, equality, and justice on one hand and the harsh realities of political corruption, corporate hegemony, and Wall Street organized crime on the other. Overcoming Empire continues the discussion, drawing on history, psychology, and spirituality to argue that the Military-Industrial-Media Complex, as a manifestation of humanity’s darker impulses to dominate and control, is fundamentally incompatible with democratic ideals and inherently destructive to life itself. This “Empire Machine,” running on a one-word program of “more,” is both addict and pusher, dealing in quick fixes and empty promises while thwarting true happiness by creating artificial scarcity, breeding competition, and sowing distrust and fear. To break the vicious, ecocidal, and suicidal cycle, we the people must stage an intervention—a nonviolent revolution—by tapping into the greater powers of Nature, of compassion, and of a genuine, living democracy. "A needed critique of empire and capitalism joined with an inspiring vision of our democratic possibilities." As global temperatures rise and natural systems decline, humanity is being forced to confront the darkening shadow of material progress and mechanistic thinking. Meanwhile we can see the dawn of a more enlightened worldview that honors the interdependence of all forms of life and all aspects of reality. Between complete breakdown and universal breakthrough lies the Middle Way of The Four Global Truths. Using the framework of the Four Noble Truths of Buddhism to address worldwide ecological suffering, outline its causes, and suggest a healing pathway forward, this book also integrates elements of Western philosophy, transpersonal psychology, deep ecology, modern cosmology, and quantum physics in advancing a more holistic conception of Nature and the Cosmos. "I want to see this book in every bookbag and backpack. I love to think of the hands it will fall into, the minds it will ignite, the hearts it will embolden!" "...destined to become an essential part of the ongoing illumination of this wild, groping, confused, but ultimately beautiful human species." If you're anything like Healthy Helen, you've probably been wondering: * What exactly is KOMBUCHA and what is it doing in my kitchen? * How can SEAWEED improve my life? * Where have all the B VITAMINS gone? Answers to these and other culinary queries lie within! But don't panic - this is NOT a cookbook! 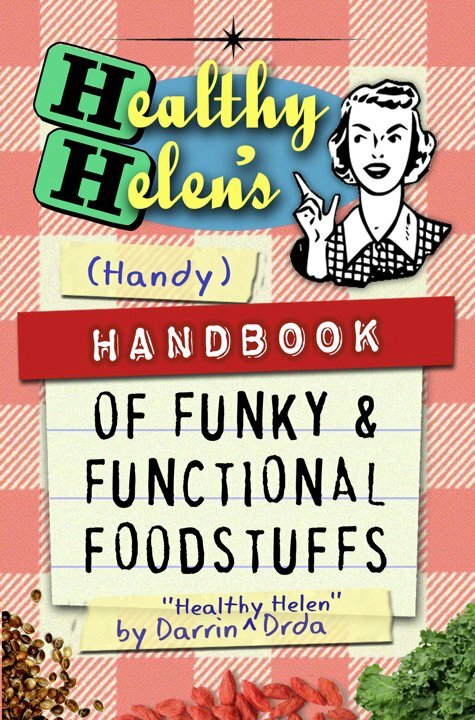 It's a fun, feel-good field guide for foodies, chock full of fascinating facts about vegetarian and vegan vittles that are funky (unusual), functional (unusually nutritious), or both! Beneficial beverages, friendly fruits and veggies, great grains, helpful herbs, mighty mushrooms, special spices, superfoods... From Acai to Yerba Mate, these are the most incredible edibles on Earth! PLUS! Interesting info on antioxidants, alternative sweeteners, fatty acids, disease-fighting foods, protein, and MORE! "Clever rhymes and cute illustrations about our human-ness. Highly recommended! Made me cry happy tears!" "Wonderful story and wonderful illustrations! Giving it to my granddaughter at Christmas. Can't wait to read it to her!" 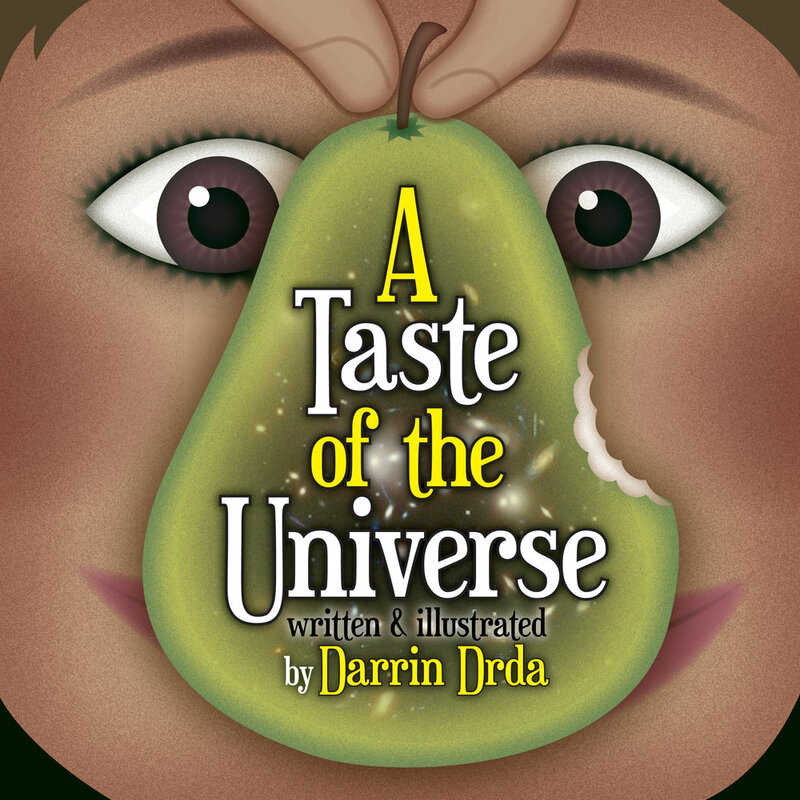 A story of galaxies, stars, and hot gas, Of earthworms and earthlings both present and past, The sun and the soil and the rain and the air, And how they're all needed to make just one pear! "Visually and textually, this book is absolutely AMAZING!! Captivating, educational and transformative, for kids AND adults. A Taste of the Universe delivers on its title, taking the reader on brilliantly clear journey through the universe and into one's self...all in less than 40 pages. This is not only a super powerful book for kids, but for adults too. I have a feeling that a lot of adults reading this to their kids will be touched and transformed by the book's magic too, for it evokes and instills gratitude, wonder, creativity, and cosmic understanding. I highly recommend this book for both kids and adults! I'm 37 and loved reading it." "My 12 year old daughter loves this book and say it's "cool". My 10 year old son says it's "awesome" and made him think outside the box. We are now calling it 'The Pear Book', though it's so much more than that!"